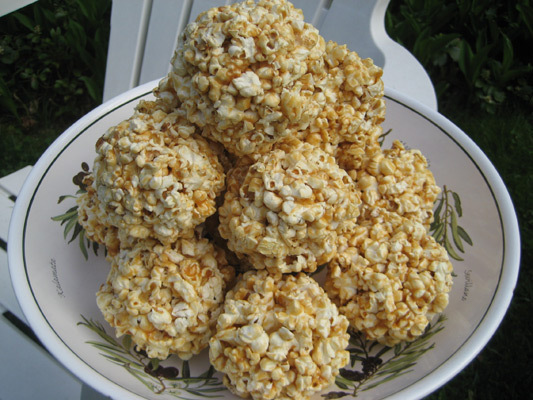 These popcorn balls are easy to make and disappear in an instant. This recipe can be used to make regular caramel popcorn, however the kids really like the balls and I kind of do too. It also makes them easier to distribute when you can toss them across a room when the time comes. If we want to take them somewhere we put them in little wax paper sandwich bags to keep them safe. Personally, I prefer to pop my own popcorn, however in a pinch I have used 2 bags of microwave popcorn and no one will know the difference. 1. Put the popcorn in a large bowl, large enough to allow for the mixing of the ingredients as the popcorn will be tossed around. 2. In a medium saucepan, place the butter, water, salt and caramel pieces and over a medium-high heat, melt the caramel, stirring constantly with a silicone spatula to keep it from burning on the bottom of the pan. When melted, remove from heat and keep stirring for a minute. 3. Slowly pour the melted caramel mixture into the bowl while using two large forks to keep tossing the popcorn like a salad. I often recruit my wife to pour while I stir, but it can be done by one person. 3. When the caramel has been incorporated into the popcorn, grab a hunk of butter and rub it all over your hands so they are nice and buttery. This will allow you to shape the balls without the popcorn sticking to your hands. It also adds a nice coating of butter to the popcorn that adds tremendously to the flavor, but isn’t enough to make them greasy. Pick up a handful of the popcorn mixture and shape into a ball. Press lightly to shape them into spheres. You should have plenty of time to do this before all the popcorn cools, as when warm it will shape easily, but if you leave it to cool first, you will have a tough time shaping it into balls. 4. Eat before your kids see them or you won’t get any. I’ve found a way to make iced tea with no bitterness, and it doesn’t become cloudy. It’s called cold-brewed iced tea. Iced tea is something I have around all year, but there’s something about a cold glass on a hot day that makes me shiver with anticipation, and iced tea is still a nice winter beverage for those who like cold drinks. The tannins in the leaves can add astringency (which equals bitterness) to iced tea that I prefer to avoid. By cold brewing the iced tea rather than using warm water, you can still extract all the great flavors without a lot of tannins. Don’t even get me started on “sun tea.” The bacterial levels in that stuff are enough to make me sick just thinking about it; leaving a jar of tea in the sun for a few hours is just not a good idea. “Sun tea” is a potential bio-hazard and iced tea made this way should be avoided. I’ve been cold brewing my iced tea for years, and this really works. This iced tea is great, and incredibly easy to make. I only wish I had known about this when I was younger. 1. Place the tea leaves or bags in a large pitcher with a top (you can use only 1 cup of tea leaves, or fewer bags if you prefer a lighter tea). 2. Add the water and place in the refrigerator for at least 8 hours, I generally let them soak overnight. 3. Strain the tea or remove the bags and drink! I like to put in a slice of lemon and a sprig of mint, but you can do anything you like. I sometimes add mango nectar, but any fruit juice works very well too. You are only limited by your imagination. Iced tea combines with almost any fruit flavor, so any juice works well. 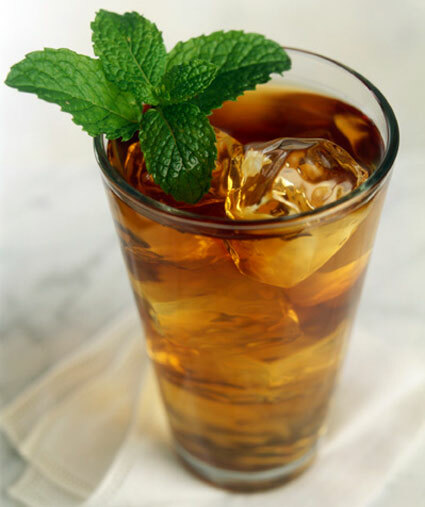 For “Sweet Tea” I just add a little simple syrup, which dissolves easily in tea unlike sugar. Having a southern belle for a wife I always have a lot of tea and simple syrup around and my iced tea is her sweet tea. Smoked salmon should be one of the wonders of the world. 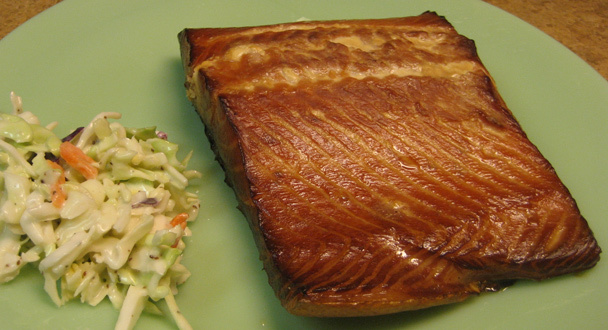 I often refer to this recipe as “salmon bacon” because that is close to what you will be making. Smoky, salty, intensely rich and complex, this salmon doesn’t last long in my house (even my picky children can’t get enough). It may be a little more time consuming that some of the other Gatehouse Gourmet recipes, but it is well worth the effort. I generally make a lot of this at once and eat it over the next few days (it should last 10 days in the refrigerator, or 6 months if frozen). The process begins with creating the brine in which the salmon will marinate for about a day (a minimum of 8 hours, and no longer than two days if you really want, however overnight is usually perfect). Mix all the above ingredients together and marinate the fish in a non-reactive container (glass, Tupperware, etc) for at least 8 hours in the refrigerator. Overnight seems to work best. The fish will cure in the brine, which will draw out some of the moisture, concentrating the flavor. It will also allow salt to penetrate the meat, which will also enhance the flavor of the fish. Remove the fish from the brine and lay it on a rack in a cool area, allowing air to circulate over the top and bottom if the fish. Allow the fish to dry for 2-3 hours, and the fish will form what is called a ‘pellicle’ on its surface, which is a thin, hard layer of protein that will both seal the fish, and allow the smoky flavor to adhere later. This dish calls for “hot smoking” which is smoking in a heated environment, rather than a cool one, which will also somewhat cook the fish. In your smoker, feel free to add any type of wood that you prefer, Apple, Oak, Hickory, etc. The fish should be smoked at about 140 degrees for approximately 2 hours, more or less depending on the thickness of the fillets (tail sections may take as little as 1 hour, while the thickest fillets shouldn’t take much longer than 2.5 hours). When the internal temperature of the fish reaches 140 degrees, it is done (a meat thermometer is very handy here). You can also tell it is done by checking to see when the meat flakes easily. The more you do this, the better your instincts will be to determine doneness. I will often double this recipe and make up to 5 pounds of salmon at a time since I can’t keep it around long enough to enjoy it. My suggestion… Hide it so you don’t have to share. 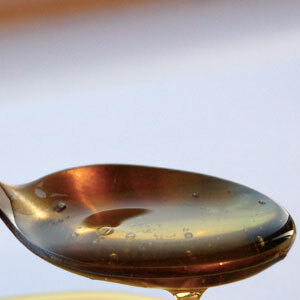 Simple Syrup (also known as Bar Syrup or Rock Candy Syrup) is a mixture of sugar and water. Usually combined in the ratio of one part water to two parts sugar, it is very simple to make and useful to have around. It is the perfect sweetener for iced tea and other cold beverages as the sugar is already dissolved and will mix into a cold liquid without leaving undissolved sugar granules on the bottom of your glass. It is also used in mixed drinks, baking, and candy making. My favorite use is making sweet tea, though. To make a simple syrup you first bring the water to a boil, add the sugar and gently stir. Once the sugar is fully dissolved, remove the pot from the heat and allow it to cool. 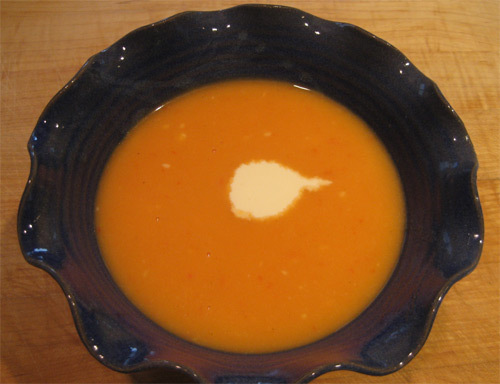 Do not let the liquid boil for too long or it may become too thick, or caramelize, or a host of other problems that make for bad simple syrup. The resulting liquid is easily stored in the refrigerator in a plastic squeeze bottle or jar which should make it easy to add to beverages as necessary. You may see recipes for simple syrup using a 1:1 ratio of sugar to water. While this will certainly work, it will spoil much more quickly, and since I like to have a lot around, particularly in the summer for iced tea, I find that the 2:1 sugar to water ratio is a better solution (pun intended). If you have problems with crystallization, add a small amount of honey or corn syrup when you are dissolving the sugar to help make the syrup more stable. The presence of different types of sugar (fructose, for example) in the mix will help prevent the sugar (sucrose) from crystallizing during storage. By adding any kind of spice or flavoring during the heating you can make interesting syrups to have around for any occasion. Vanilla, cranberry, cardamom, lavender, there is no end to the flavors you can add. Pretty much anything you can imagine may be used to flavor simple syrup, so don’t fear to experiment. Tip #1 – 2:1 sugar/water is the best ratio for storage. Tip #2 – Don’t over boil. Tip #3 – Add a touch of honey or corn syrup if crystallization is a problem. Tip #4 – Add flavors for fun.